THE BRITISH RAILWAY STORIES LTD: "The 5th Anniversary Announcement"
Today marks the fifth anniversary of the above video. Currently standing at a frankly incredible 504,703 views, this is the video where it all began, and where I look to to remind myself as to why we keep doing this. I remember the first time we started editing this episode together. I was fuming, silently, in a corner. I didn't like the revised script at all! I recorded my voice for the episode and felt a little happier. The models looked really good on screen, and the faces, though simplistic, seemed to bring something more characterful to the engines. Allen, young, naive and cheerfully optimistic. Stephen, wise and always smiling. Sir Ralph, looking rather vindictive at this point (but would turn out to be a great engine after all). The set's modelling was of a low standard, as were the sound effects. The models were virtually untouched from their packages. Carriages and trucks were whatever I had in my loft, leftover from the days when my father and grandfather would play trains with me as a young boy, bright eyed and at primary school. When my grandfather passed away, there were a few things in my life which seemed to instantaneously disappear. I could, for a good few years, no longer read about steam locomotives, British Railways and the like. His magazines, along with a single spotting log, apparently the 9th in a long line of logs, with several encyclopedias and well worn and underlined Ian Allen ABCs, were kept on a shelf in my room, untouched for many years. I has also lost my love of Eltham College, the school I went to. He had been an Old Elthamiam, and I lived for the way he'd smile and pat me on the shoulder when I dropped in on my way back from School. I used to say, for many years, that every now and again, I'd feel his presence when I stood in the College's grounds, but I have been unable to go back there for some time. The memories, and feeling of his loss, are too painful to bear. Eltham College was good to me, don't get me wrong. Yes, there were bad times, but then you have to have the bad times, otherwise you don't appreciate the good times. I loved my time at Eltham College overall, and it's simply that it will never feel the same for me that I cannot return there yet. Sometime in 2004, however, there was a call to arms to "Save our Scotsman". I managed to do a good few laps of the college's "Chinbrook run" - a cross country route taking in the sights and sounds of Mottingham and Grove Park (!) whilst traversing part of London's Green Chain Walk - in an effort to raise money for the NRM to purchase 4472 Flying Scotsman, for the nation. I felt it was something my grandfather would have wanted, Scotsman always a favourite of his. It was at this point, I think, that the original spark of creativity for The British Railway Series (as it was then known) was born, and I spent the next two years writing in snatched moments, mostly at night (though unlike Timothy Hackworth, working on Sans Pareil all those years ago, I had a torch and not a candle). Three direct inspirations stood out. An old Hornby-Triang model of a Holden B12, finished in green as 8572, and known colloquially as "Stephen". A visit to see the newly constructed frames of Tornado, earlier in life, and A1 Trust letters and leaflets left around for me to read. A Hornby catalogue, with a three locomotive box set of the A4 Pacific Sir Ralph Wedgwood, ringed for a future purchase (never made, I believe). The fire was lit again, and a burning desire to write stories for children was born. There were deviations from the path most certainly, but in the end, I just kept returning to the world of coal, fire and steam. A fire first lit by my grandfather, and for him, it will keep burning to the day I pass on from this world. All of this would directly led to the characters Stephen, Allen and Sir Ralph, who would go on to be the most popular of all of the characters introduced in the YouTube series over the next five years. The first eBook is more or less how Episode 1, above, should have happened! In the event, I am glad it turned out this way as it's made the development of the stories interesting. Never a dull moment, always striving to do better with every video, and from now on, every publication. It is at this point that I must make something quite clear. If the eBook does not sell well, there will not be a print run. Print runs are expensive, even for a small run of say 504 copies. The first eBook must fund its print run, more or less. It's a sad fact that the series doesn't make enough money in a year to warrant risking the purchase of physical copies yet, but I am hoping as the sales gather momentum, and the new series airs in the course of the next year, we will be able to provide beautiful, fully bound hardback books for sale on our upcoming new website. It's with that in mind that I decided to give us all a bit of impetus today, with a major (and I mean major!) announcement. 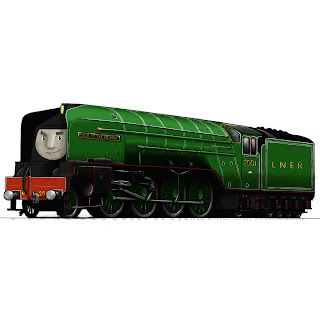 That's right - one of the most impressive locomotive classes to appear in Great Britain will appear next year for the first time in The British Railway Stories. The story centres around the development and introduction of the Gresley class P2 on the London & North Eastern Railway, with an in depth examination of their history at the back of the book, along with character profiles and a new train spotting table. I am very excited about the second book, and you should be too. On board as artist once more is the exceptional talent that is Dean Walker; and together I can say confidently that we intend to produce another quality piece of children's literature; the balance between entertainment and education hitting the spot, as I feel we've done with Tale of the Unnamed Engine. For Book 2 to go into full development, we really need Tale of the Unnamed Engine to keep selling. I have had a bit of a setback with the iBooks version, but the Kobo version of the book is ready for release next week, which will open it up to yet more eBook markets across the world. It's an exciting time to be on board with The British Railway Stories. We're going from strength to strength, with a determined eye towards the future, and a misty eye looking back at where we've been. If we can remember the good times with the bad, and learn from our past mistakes, then the future will be brighter with every passing day. One thing which has always been clear to me is that there are no problems: only solutions, and it is this which has led us through eighteen YouTube episodes, and to our first eBook publication this year, with more planned and on the horizon. I started out with nothing but an idea: and now I own my own company (albeit with not a lot of money and no real assets but the website, YouTube channel, and eBook to speak of at present! It is, however, the best start we could have for the stories). We've had 6.2 Million views on the YouTube channel since 2007, and well over 15,000 comments across the eighteen episodes of the stories. This blog has gone from strength to strength, and has had over 300 blogs with 200,000 views and more across them. We have a Facebook group of around 300 members, who are great fun and have supported us for several years now. The company now has its own "like" page on Facebook which is proving to be a very powerful marketing tool. Then of course, there are other eBooks, special promotions and merchandise in the pipeline over the next year...but I can't (and won't) release details yet until I am sure they are happening. The future looks bright, as I say. Things can happen if you try: so the message of The British Railway Stories is clear: never give up. That was beautifully written simon i'm sure where ever he is now your grandfather is looking down on you proud and you should be!